What is the probability AC079 will receive a bid in the next lease sale? If so, how much is the bid likely to be? 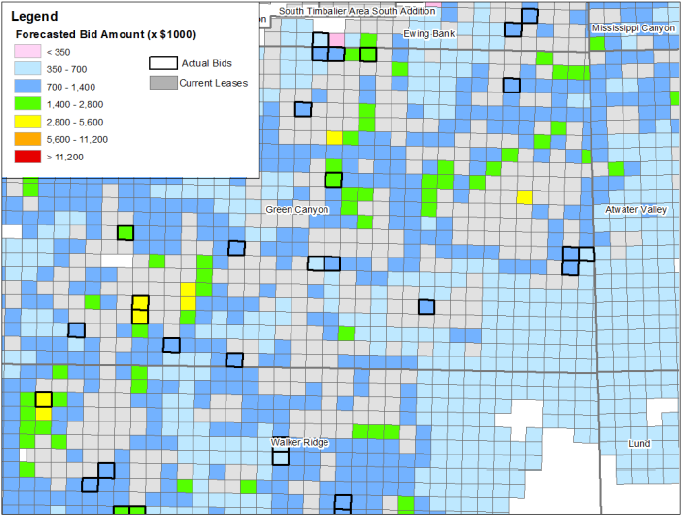 How much does proximity to its current leases influence bidding by Hess? Will a positive change in oil price last year influence the bids in the next sale by Houston Energy – or ExxonMobil? In the last 10 years, how much has Shell spent on winning bids – and how much money did they leave on the table? These are the questions answered in the Block/Bidding Evaluation and Post-Sale Charts components of the Business Planning Add-On to GOM3. If your company does win AC079 – and your prospect comes in – what is the most efficient routing to tie it back to the ExxonMobil’s Hoover Spar in AC025? What is the current spare capacity on Hoover? What are the other options? Our new Tie-Back Tool was developed to answer these questions. ESA, which introduced GOM3 in 2000, now announces analytic tools that exploit that rich data through mathematical and spatial modeling of over 18,000 deep water bids and more than 12,000 deep water leases. Earth Science Associates developed two models for forecasts of bids in future sales. The first estimates the probability of at least one bid on deep water blocks. Block characteristics, from water depth to proximity of relinquished leases, to the history of past bids, have all been tabulated and are updated daily as changes occur. Additionally, there are global variables (e.g., oil price) and company-specific variables (e.g., how far is the nearest lease owned by ENI?). In all, we evaluated two dozen variables. For the 20 companies that dominate deep water, we calculate the marginal positive and negative preferences toward these block characteristics, as seen below. 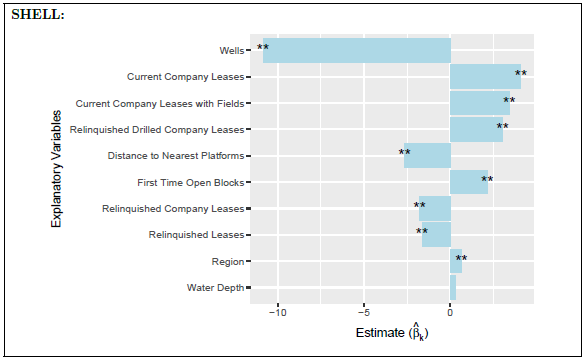 The tornado plot identifies the explanatory variables (listed along the y-axis) shown to be statistically significant in estimation of bid likelihood for Shell in the spring 2018 sale. A positive estimate results in an increase of probability of bidding and a negative estimate decreases the probability of bidding. Some companies are less likely to bid in deeper waters, others systematically stay close to their existing leases. The company-level analyses of each block are then combined to esti-mate the probability that each block will receive at least one bid. We call this the Bid/No-Bid model. It is estimated using logistic regressions. 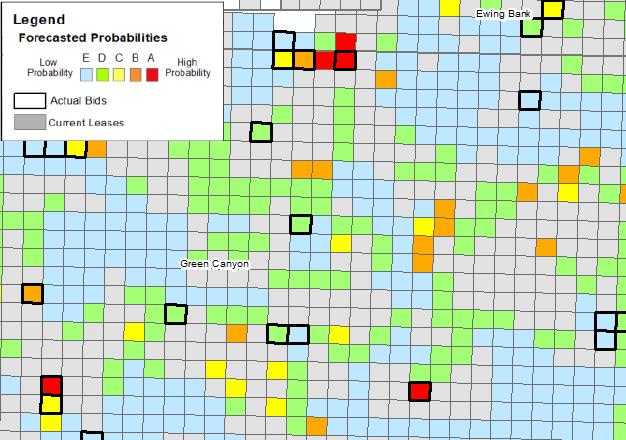 A map of estimated probability of at least one bid in the Spring 2018 sale, focused on northern Green Canyon. Current Leases are shown in grey, ESA’s pre-sale probabilities of bids are shown in the legend colors and those blocks actually bid are surrounded by thick, black outlines. The second model, shown below, forecasts the amount of the high bid in deep water blocks. Like the Bid/No-Bid model, empirical block characteristics and companies’ historically evidenced preferences are included in the Bid Amount model. This model is estimated with a multivariate linear regression of past bids. These regression models train over specific periods, which the user controls. Any period since 2009 of at least three years can be used to train the models to forecast for 2013 through the upcoming sale. For the historical sales (2013 and spring 2018 sale), forecasts can be made to compare the forecasted probability of Bid and Bid Amount with what actually occurred in the sale. A map of the forecasted high bid amount in the spring 2018 sale, focused on northern Green Canyon. ESA’s estimated bid amounts are shown in the legend colors. These two models provide systematic analysis of bidding behavior and an objective set of updated benchmarks, on constantly updated information, to analyze your competitors and examine the relative attractiveness of regions and blocks within them. Through the power of GOM3, model results can be combined with the data and tools there and, more importantly, with your company’s proprietary geoscience, engineering and scouting information – as well as a company strategy. Why ponder a big, static war-room wall map when you can use state-of-the-art models based on data refreshed daily? To complement the forecast models, we have prepared a set of pre-made charts and maps that distill key decisions made in all previous deep water sales (1983 to present). They bring company statistics into focus: bidding budgets, efficiency of those expenditures (amounts exposed in winning and losing bids, money left on table) how those parameters have changed over time. Other charts summarize what happened in a given sale or in all sales over a specific period. 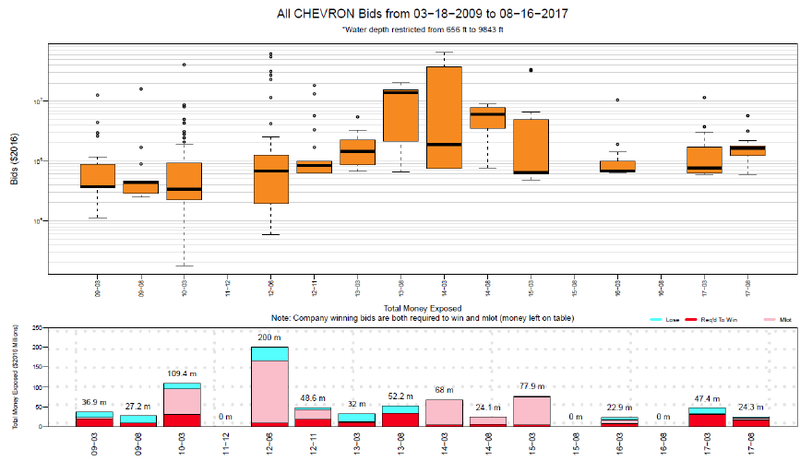 Chart shows the bid amount of Chevron from 2009 through 2017. The top chart shows a box and whisker plot of the bid amount distribution for each sale and the bottom chart shows a bar graph identifying money spent on winning bids (money left on table and money required to win) and losing bids. We have also introduced a network analysis chart that is new to the industry. Each company bidding in a sale is a node; blocks bid in the sale are also nodes. 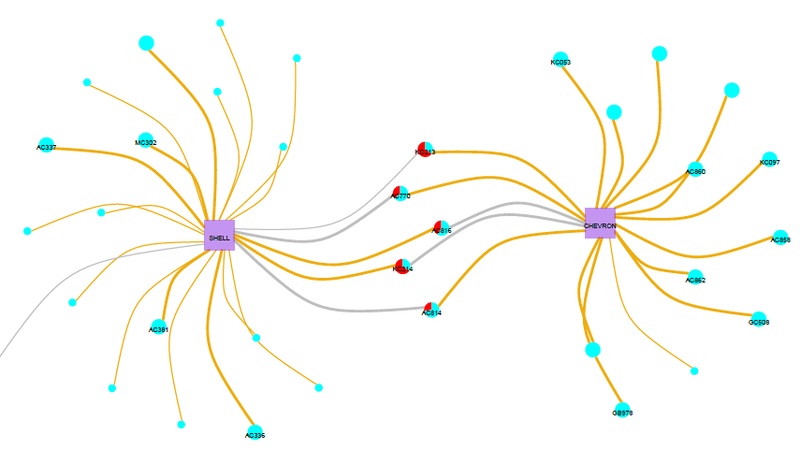 Links from company nodes join to the nodes they bid on (gold for winners, grey for losers) When companies bid jointly, the company links meet at an intermediate node and then connect to blocks bid by that partnership. When multiple bidders connect to the same block, the block node turns to a pie diagram, showing the amount required to win the block (2nd highest bid + $1) and difference between that amount and the high bid – what was left on the table. Since 2009, of the $9.8 billion paid for leas-es in deep water - $2.6 billion stayed on the table. Network graph displays Shell and Chevron (purple squares) results for the fall 2017 sale. With increasing water depths and the declining sizes of new finds, transportation of oil and gas from your new discovery to shore will be central to the economic viability of the project – and the amount your company is willing to bid on the block. Using a network of 78 million nodes, reflecting bathymetry and the location and types of seabed hazards, our Tie-Back Tool computes an optimal pipeline path from your discovery to as many alternative destinations as you want to test. In a simple interface, identify the tie-back origin. We will present you with a list of the 15 nearest platforms within 75 miles, their straight-line distance, along with operator, water depth information and our estimates of the spare productive capacity (updated monthly). Set some parameters on the relative importance of route slope versus distance and maximum slope and run. Within a few minutes, you’ll receive a zip file with a proposed pipeline route, given bathymetry and hazards. Alternatively, route your tie-back directly to join an existing pipeline that may be closer than the nearest platform. 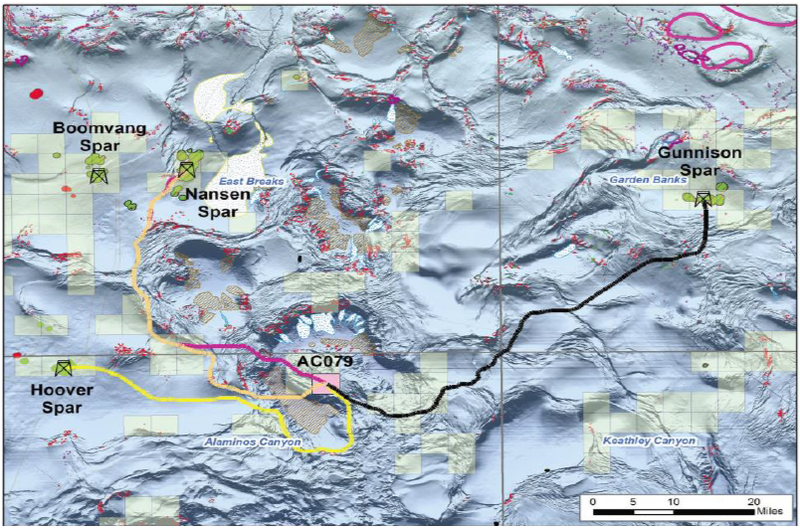 The map shows 4 tie-back routes from Alaminos Canyon 79 to 3 platforms: Nansen Spar, Hoover spar, and Gunnison spar. There are 2 routes to the Nansen spar: one avoids seafloor obstacles (magenta) and the other does not (peach). To test sensitivities to different destinations just rerun the tool. The results include detailed summary reports going over basic statistics and characteristics of the optimal pipeline path. Like the Bid Models, the output of the Tie-Back tool also includes all of the GIS-ready results for integrating in GOM3, where it can be combined with other data like the vast sets of proprietary data needed to make the best decisions. 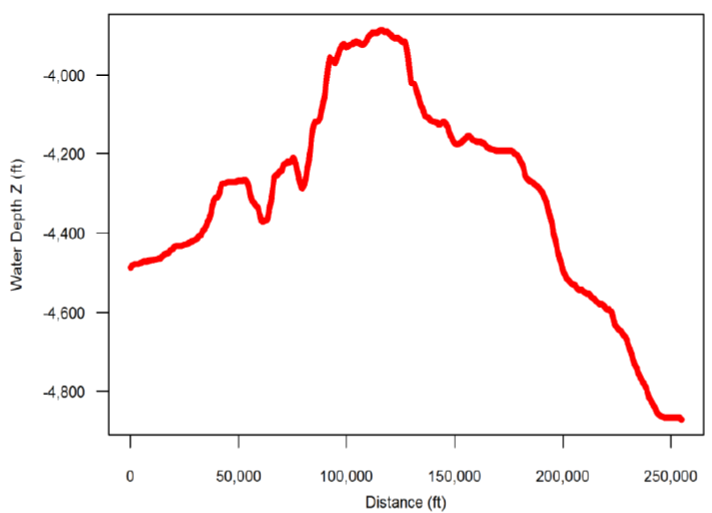 Graph shows the vertical profile of the difficult pipeline path from Alaminos Canyon 79 to the Hoover Spar. The Forgotten Oil & Gas Study, originally created in 2014 but updated in 2018, identifies reservoirs, sands, fields and completions that appear to have unproduced hydrocarbons. The largest part and most detailed work was done on reservoirs, cleaning up the operators' names and identifying the completions within each reservoir. Once the names were matched to ensure that production from subsequent completions within a reservoir was not an issue, decline curve analysis was run on every reservoir in the Gulf of Mexico, using a statistical fit score (R2), to determine the best of the three standard models (Exponential, Cumulative, Hyperbolic). Output for all three models is downloaded as part of the output, along with other statistics of the decline curve analysis for each reservoir. The distribution of oil and gas remaining in produced reservoirs, based on decline curve analysis throughout the Gulf. Many reservoirs were found that were not in terminal decline at the time production ceased, so decline curve analysis could not be performed. These reservoirs were identified and high-graded by daily rate of production. Each year, the BOEM releases the amount of cumulative production and estimated remaining reserves for each field in the Gulf. Similar statistics are released for sands within each field as well. Naturally, as new reservoirs are discovered or new technology is employed, the sum of the production and reserves (the estimated ultimate recovery) can rise. However, for unknown reasons the government will occasionally revise the estimates downward, sometimes significantly. Although there may be good reasons for doing so, these fields and sands are highlighted in this study to make the search for interesting targets more efficient. 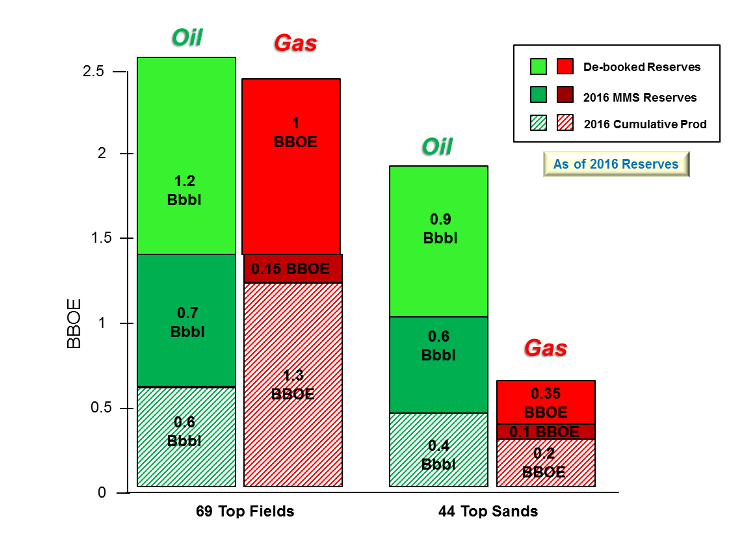 Oil and gas production, reserves and 'de-booked' reserves for all fields and sands in the Gulf of Mexico. The final category of data in the study gathers completion interval which had high test rates, but didn't ultimately come online. Again, there are likely a variety of reasons for this to happen, but this study can save time identifying potential targets that are worthy of more investigation. Overall, the Forgotten Oil & Gas Study is the perfect tool for quickly identifying targets with known hydrocarbons (lowering risk) and saving time for those who wish to work up old fields and save money doing so.